Previously we have written about node.js and socket.io. Today we continue the topic by developing real example. 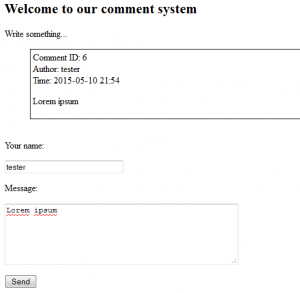 We will create a simple, efficient commenting system between users. Data processing and refreshing the list of comments will be done in real-time, for all users having our web application opened. Step by step, from scratch. The functionality of comments will be simplified, but easy to adjust to own needs (data, front end / back end code). Here we focus on using node.js and socket.io. We assume using our simple system for commenting articles. Not necessary when we already have these modules installed globally. Create a database (e.g. node_tests) and simple table (e.g. tbl_comments). Sample SQL code below. Please pay attention especially on DB table config, port and host for communication. Now we can go to implementation of elements based on node.js and sockets. Proper implementation will start from a simple HTML5 page, where we put the code responsible for sending the data to server-side script. To make it working we have to include socket.io.js library. That file must be served through e.g. PHP. Simple opening HTML file in the browser will not work. In our case it’s PHP. That code should also perform operations like getting currently commented article ID, history of comments or configuration. We can write it quickly using our favorite PHP framework (for example Yii2). So here we skipped the implementations of these elements. The rest of the code deals with the event handler for “add_comment”, which occurs when data is sent by the server. Information will be displayed to all connected users. which prevents displaying information about the comment under articles different than desired. We also should remember to show the history of comments. When you refresh the window, comments disappear from view. They are of course stored in the database (tbl_comments), we just need to grab them and generate (as elements of the “messages” list) using e.g. our PHP framework. Newly incoming comments will be simply appended to the list. socket.io magic beings! In io.sockets.on(‘connection’) we handle data coming from connected sockets (user). Inside we handle the socket.on(‘send’) event – new comment coming from user’s browser. At this point we gather / process the data. Then we call the insertComment() function, which saved the data in DB. The parameters are: current socket with necessary data, and our processed array (we need to send it easily to the client-side code). If the query has been executed properly, we get ID of inserted comment (insertId) and current date-time. The tools.js file with additional functions you will find in complete sources (GitHub). We can now run what we created! It doesn’t matter how many browser tabs/windows we open. The comment send in one of them, will show in the rest of windows immediately! That’s the beauty of socket.io. 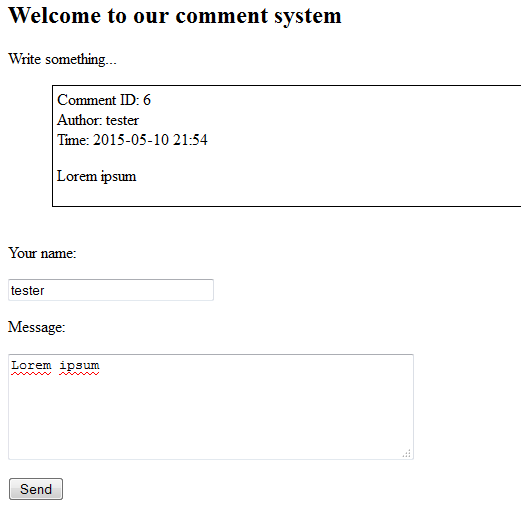 So here we have written and discussed our simple real-time comments system. With node and socket.io we reached working effect pretty easy. Code can we adjusted to our needs and connected with real web application without major effort. Can you tell me how can I fix it? yes, I use code from github. I have change just user and password for DB. Also I have install socket.io and mysql. I use 1350 port. my db works on 3307 port. But if I change port in config.general.port = 1350 to 3307 in config.js I have this error “Error: listen EADDRINUSE”. Which port I need to write in config.js?